When The Vampire Diaries Season 7 Episode 5 begins, we flash forward three years. Bonnie is in therapy lamenting the past and what her life has been for the previous three years. She carries regrets...and a torch for Enzo. In the present, Alaric watches Jo as she sleeps. Bonnie stops by to bring him work and asks to study the Phoenix Stone. As she leaves, Jo wakes. Caroline wakes up next to Stefan when Damon barges in with coffee. He has decided to turn over a new leaf, but he needs Stefan's help interrogating Valerie. Caroline sends Stefan along with his brother while she goes to class. Oscar cannot get enough blood. Enzo sits with him to keep him from killing people. Lily prepares the house for Julian's return. Mary Louise and Nora realize that Oscar is unwell since he doesn't remember them. Valerie is on her way to kill Julian before Lily and the other girls can get to him. Damon and Stefan stop her on the road to join her on her journey. 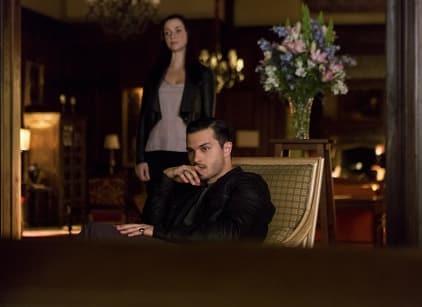 Damon deduces Valerie's reasoning for wanting to keep Julian away and then begins grilling Valerie and Stefan on how they met, which is uncomfortable for them both. Jo, like Oscar, cannot remember her life prior to dying and being resurrected. She knows nothing of her marriage to Ric, or her aversion to meat, but knows how to bandage wounds. Bonnie finds Enzo at the Salvatore boarding house and together they discover Oscar feeding on the maid. Enzo rescues the maid while Bonnie learns that she brought Oscar back from inside the stone. Valerie informs the brothers that the stone is full of the souls of dead vampires. It doesn't return the correct soul to the correct body, so Jo is now a vampire. Sort of. Damon calls Bonnie to tell her that Jo isn't Jo and asks her to tell Alaric that Jo isn't really Jo. When Oscar tries to attack Bonnie, Enzo comes to her rescue. The vampire inside Oscar's body learns that the body is powerful and full of magic. Jo also begins to realize that she isn't Jo. While wandering through a room of coffins searching for Julian's corpse, Stefan asks Valerie why she tried to hurt him by hurting Caroline. Her only response is that he knows nothing about her. They find Julian's body, which has been preserved with magic, and Valerie tries to set it on fire but it won't catch. Mary Louise and Nora appear out of thin air with Lily and Beau right behind them. Lily asks for a moment alone with Valerie and assures Damon and Stefan that whatever their quasi-stepsister has told them about Julian is a lie. She and Beau take Julian's body and Valerie blurts out that it was Lily's idea to put Elena into a coma. Damon tries to kill his mother, but Beau stops him. When Stefan and Damon come to, Valerie is gone. Stefan makes Damon promise not to do anything stupid and then goes in search of his first love. To save himself, Enzo kills Oscar. Stefan rescues Valerie and she tells him the truth about why she never came back. Lily finds Oscar's dead body and learns that her son died two nights prior. Enzo reveals that he has the Phoenix Stone and she chooses the stone over his devotion. Bonnie sips bourbon in an empty Mystic Grill while Alaric looks for Jo at Skull Bar. Bonnie breaks the news to Alaric that Jo isn't really Jo. Alaric spots Jo on the street and tells her they'll figure it out together. Stefan bails on his date with Caroline and vows to Valerie that he will kill Julian if Lily is ever successful in resurrecting him. Damon and Bonnie plot to take Julian from Lily once he has been returned.